Fireman John Gage: I want to find out if it's a job, or just a title. Fireman Roy DeSoto: It's a job all right. It's going to be the most important advance in emergency medicine in the last fifty years. Every kid I knew who watched Emergency! as a kid in the 1970s wanted to be a firefighter. Indeed, it would be interesting to know how many of today's paramedics, firefighters and medical staff first found their calling by watching this series. Jack Webb, creator of 1968's Adam-12, the first television show to realistically portray the law enforcement profession, set out to follow the day to day routine of those in the newly realized field or paramedics, a first response team that would treat victims of various accidents on the scene, prior to shipment to a hospital. Up until 1969, when then governor of California, Ronald Reagan, introduced the Wedworth Townsend Paramedic Act, the only personnel permitted to administer care in the field were doctors and nurses. By training fire personnel in emergency first aid, including the administration of drugs and CPR, the lives of many patients could be spared by stabilizing them at the scene. Webb based the character of John Cage on a real firefighter who was partly responsible for creating L.A.'s paramedic program. This first season of Emergency! includes eleven episodes and the series pilot (which I can't recall ever seeing before). Appropriately named The Wedworth-Townsend Act, we are introduced to Gage (Randolph Mantooth), a fireman for the Los Angeles fire department, who, after one of the victims he daringly rescues dies as a result of the length of time it took getting him to the hospital, learns of a new paramedic program being developed in conjunction with legislation before congress. Initially reluctant, he is encouraged to participate by fireman Roy DeSoto (Kevin Tighe), who has already undergone the training. Although a first response team seems like a no-brainer, there are those who oppose having non-medical personnel practicing in the field, including the chief surgeon at Rampart General Hospital, Dr. Kelly Brackett (Robert Fuller). His coworker and girlfriend, Nurse Dixie McCall (Julie London) supports the program, and through the course of this episode we see how Gage and DeSoto become paramedics at their new home, Station 51. Each week, Emergency! depicts a typical day in the life of a Los Angeles firefighter, as the crew of Station 51 respond to a variety of situations, working in tandem with the medical team at Rampart, receiving instruction via radiophone. The first season includes car accidents, a brush fire, hazardous materials, a building collapse, plane crashes, a parachuting accident, a crane rescue, heart attacks, botulism, an elevator rescue, a man exposed to radiation, and a child trapped underground, among other incidents. The series not only shows life inside the fire hall, as Gage and DeSoto work alongside fire fighters Chet Kelly (Tim Donnelly), Marco Lopez (Marco López), Mike Stoker (who was a real fireman) and the captain, it also covered conditions in Rampart's Emergency Ward as doctors Brackett, Joe Early (Bobby Troup), and Mike Morton (Ron Pinkard) work to save lives with the help of their nursing staff, including McCall, Sharon Walter (Patricia Mickey) and Sally Lewis (Deidre Hall). In addition to delivering an interesting mix of dramatic rescues, these shows also provide a good introduction to the hazards present in the world, including the dangers of electricity, chemicals, and unsafe buildings. I can recall finding this show very educational, even if I wasn't aware that I was learning something, and the characters provide important role models, as professionals who routinely risk their own safety in order to help others. Even for adults, the situations depicted could be beneficial in avoiding or dealing with an emergency situation, and Emergency! has been credited for saving lives from the information it conveyed. In the era when the show was first broadcast, how many viewers would have recognized the signs of a heart attack, or other common reactions to drugs or ailments without this series? One of the big draws is the utilization of all the medical equipment and fire fighting apparatus, and the parade of vehicles and gadgetry remains appealing. I'm sure that a lot of kids (and adults at the time) were introduced to EKGs and defibrillators, learned about IVs, D5W, Ringers lactate and lidocane, and were exposed to the challenges the men and women serving in rescue and fire deal with on a daily basis, not just in the heroic rescues, but also the more mundane and bizarre situations that people find themselves in. Although many of the incidents depicted are serious, the show maintains a lighter edge in the personality conflicts between the characters. Weird Wednesday has John predicting that it is "one of those days" when a series of bizarre calls seems to invade the firehall. DeSoto is chided for his culinary abilities in Cook's Tour, and Gage tries to shirk his responsibility when he agrees to look after a rescue victim's dog (The Mascot). There are a couple of tie-ins with its predecessor, Adam-12 in this season, although the continuity is a bit confusing. In the pilot, officers Reed and Malloy (Kent McCord, Martin Milner) appear at the hospital, as part of the L.A.P.D., however in Hang Up, the station crew are called out on a rescue while watching the series on TV. 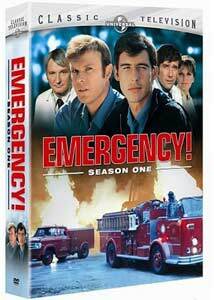 Despite the number of series that have succeeded it, Emergency! remains one of the greatest real-life action series ever created. Image Transfer Review: Image quality is very good overall. Colors are strong (almost too strong), and black levels are solid. Detail is very good, grain is present but natural, and only becomes distracting in some of the stock footage shots. Defects are minimal, as is aliasing or other transfer induced artifacts. I can't say I've seen the show looking better. Audio Transfer Review: Audio is clear and virtually free of any distortion. Dialogue is easy to make out. There is some spurious static in a few episodes, which isn't overly predominent. For a show of this vintage I have few complaints. Extras Review: The only extras are front loaded, but skippable, trailers for Universal's TV product (Columbo, McCloud, MacMillan and Wife, Emergency!, Adam 12, The Rockford Files, Murder She Wrote), Baa Baa Black Sheep and Northern Exposure, which open side one. There is a Play All feature, but a scant four internal chapters per episode, none of which allow easy access to the credits or skipping the opening credits. The two, double-sided discs are housed in a pair of standard keepcases inside a medium weight box with raised lettering. Emergency! was one of my favorite series as a kid, and it still holds up today, with an excellent cast, solid writing, and a variety of situations to keep things interesting. Packed with action, humor and educational to boot. Recommended.